And then on July 31, the winning name was revealed - and it's Mosi, which means "first." Seems like a fitting name for the first Masai calf born at the park. Other choices popular with fans were Baraka ("blessing") and Shingo ("long neck"). Mosi has journeyed out into the Kilmanjaro Safari's savannah with his mom, so the next time you're at the Animal Kingdom keep an eye out for the little guy. 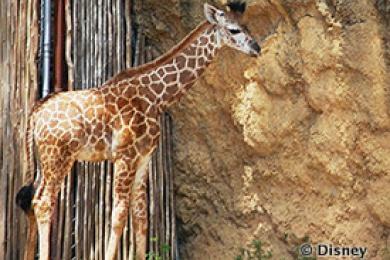 You'll find him with the other Masai giraffes and reticulated giraffes roaming the Safari's savannah. 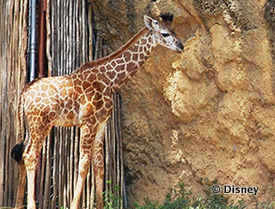 And if you aren't sure about the differences between Masai and reticulated subspecies of giraffes, here's a hint: The Masai giraffe's coat features jagged-edge patches of dark brown on a cream background, while the reticulated giraffe's coat features a pattern of defined patches that are usually orangish-brown separated by white lines. Also, the lower part of their legs are lighter in color. Saw him last week. Big baby! So cute! I love giraffes!